Budget Noise Cancelling Headphones that offer good performance are hard to come by, isn’t it? 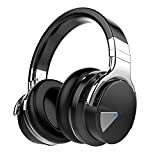 You can find tons and tons of Active Noise Cancelling Headphones under $100 that don’t work properly because people don’t know how a good Active Noise Cancelling Headphone should work. Hence today we’re going to do the Cowin E7 Pro review, which is a successor to the already immensely popular Cowin E7 and we’ll see how this headphone fares with its Active Noise Cancelling wizardry and what one should expect from an Active Noise Cancelling Headphone. In this Cowin E7 Pro review, we’ll also see how much is the ‘Pro’ version upgraded over the regular Cowin E7 headphone. Before I start, I do want to mention that ‘Cowin’ and ‘Cowon’ are two separate brands and I myself got confused between them. Hence without wasting any time, let’s jump on the review bandwagon. At first glance, the headphone, just like its predecessor looks bulky and larger than other regular headphone altogether, however the E7 Pro is lighter than the original E7. Comparing to other Active Noise Cancelling Headphones in the same segment, the Cowin E7 Pro feels heavy, however is sturdy at the same time. The earpads too give the headphone a bulky look, which on the other hand are comfortable to wear (though not for longer duration) due to its leatherette material. They also swivel 90 degrees and can be kept flat on the floor. While the head band too seems strong and flexible, with its entire length covered with faux leather material as well. The Pro upgrade also includes a brushed metal finish on the outer side of earcups, which gives it a premium look and can also act as head turner. On the contrary, the Cowin E7 Pro’s plastic build quality may budge few users and might make it feel cheap. Nevertheless, the headphone’s heftiness makes up for the penny-pinching construction. The problem with most over-ear headphones is the clamping force that occurs on temples of our head and is existent on Cowin E7 Pro when you wear for more than half an hour. I’d still recommend to flex the headband quite a few times before using it. As I mentioned earlier that the headphone is big, naturally the box in which it arrives is also big as well. Inside the package, you get the headphones itself, along with a USB Charging Cable, AUX cable and a nice solid case with mesh pockets inside to carry the headphone easily along with its accessories. I’m also listing the package of the contents below in a list format for the TLDR guys. Comparing the Cowin E7 Pro directly with Cowin E7, you can tell that there’s much better sound improvement in the latest version. Where the Cowin E7 used to sound tinny and absurd with the Active Noise Cancelling feature ON, the E7 Pro holds its ground and offers a much better Sound balance between the Lows, Mids and Highs. Inclusion of 45mm drivers, compared to 40mm drivers found in most over ear headphones, offers a wider frequency response. This helps music to sound fuller and the bass response is direct without sounding boomy at any point. Though the mid range isn’t its stronger point, hence vocals might seem a little off for trained ears. Having said that, not only is the performance better than E7, it’s also stands outs against other similar priced competitors. Moreover with use of equalizer feature in the music player app on your smartphone, you can tinkle with the sound output almost according to your liking. So if you ask me, you do get a lot more of sound improvement with an increased budget of $20 over the original Cowin E7 Active Noise Cancelling Headphones. For people like me who are lazy and forgetful about charging their wireless devices, the Cowin E7 Pro helps somewhat; as it offers a big 800mAh battery that provides a listening time of 30 hours as stated by the brand, however in reality, you can expect over 20+ hours of average battery life on full charge. Though the headphone sports NFC technology as well, it loses some brownie point because of older Bluetooth 4.0 technology, which isn’t as power efficient compared to Bluetooth 4.1 or Bluetooth 4.2 technology that one can find even in cheap wireless earbuds too. Bluetooth Mode with Active Noise Cancelling ON. Hence depending on your surroundings, availability and battery life, you can switch between any of the four modes. Basically 1st mode will drain the battery faster, whereas the 4th mode won’t eat into the battery at all. Besides that listening to music via 4th mode will offer better sound quality compared to sound quality while using 1st mode. To be honest, I can go on and on about all the intricate details about this headphone and turn this 1000 words article into a 2000 words article. However, that won’t matter because the Cowin E7 Pro is meant for masses who just want to know if the headphone will be a good purchase or not. Hence too say the least; the Cowin E7 Pro is surely how a Pro upgrade should be over a regular version. It has better sound quality, better build quality and a nicer appeal compared to E7. However due to its sheer size, it might feel a little awkward to take this headphone outside to listen music during your commute, and it’s really not meant for that purpose as well. Moreover due to its faux leather padding, your ears are going to feel fatigue after couple hours of continuous listening, however it’s not a deal breaker because most headphones, even the pricier ones comes with Faux Leather earcups. For the price, is the Cowin E7 Pro worth it? Yeah definitely it is and is slightly a better performer than its competitors. Moreover, should you upgrade if you already own the Cowin E7? Yeah! If you can, you should upgrade to Cowin E7 Pro because it is better performer with a trivial increase in price.